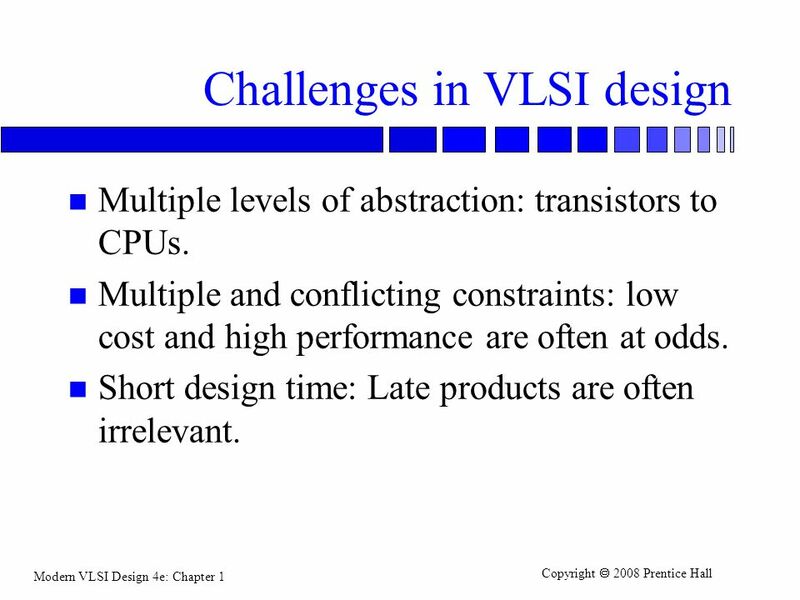 Overview Why VLSI? Moore’s Law. The VLSI design process. 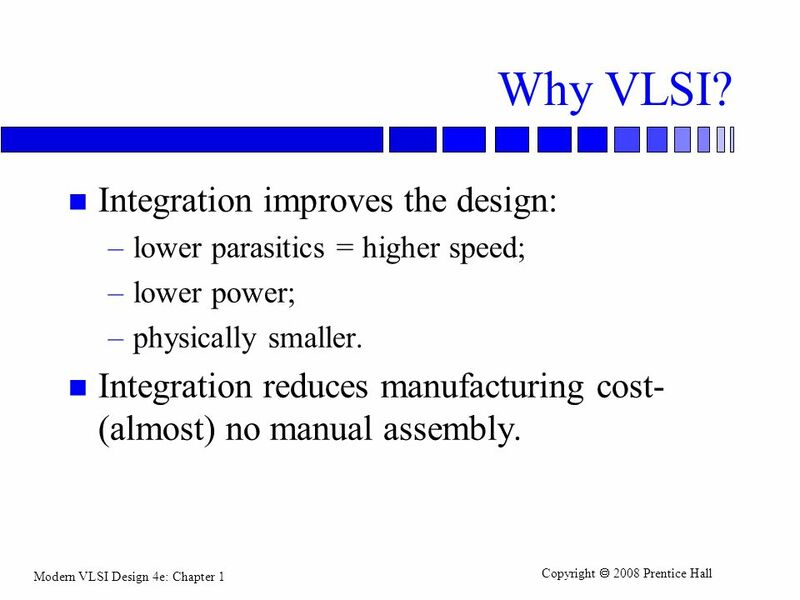 1 Overview Why VLSI? 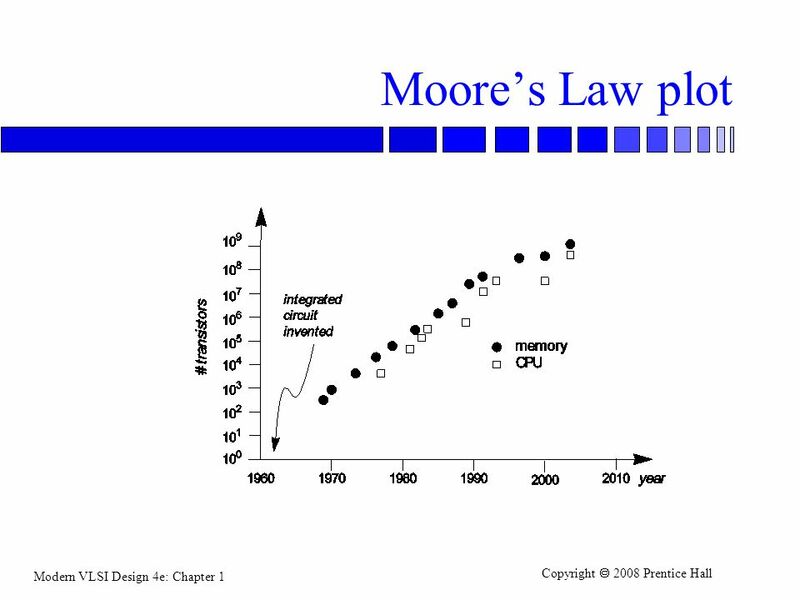 Moore’s Law. The VLSI design process. lower parasitics = higher speed; lower power; physically smaller. Integration reduces manufacturing cost-(almost) no manual assembly. 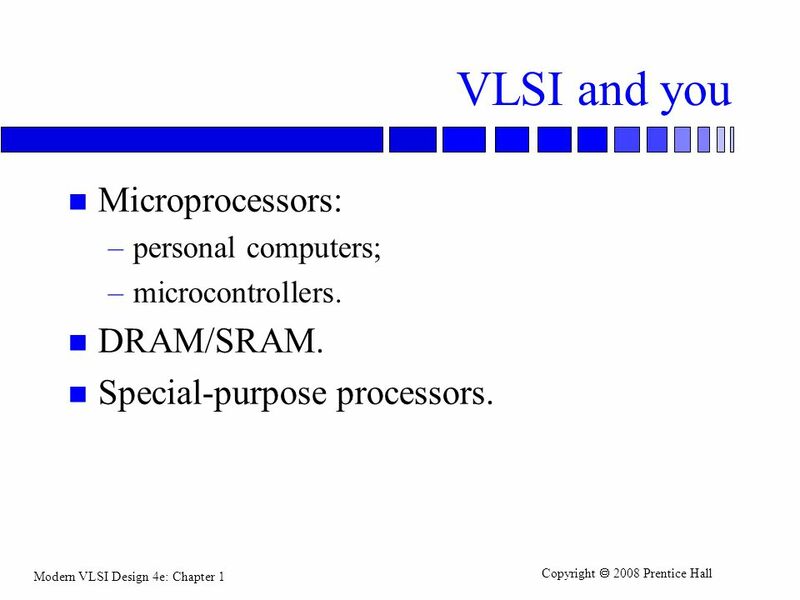 3 VLSI and you Microprocessors: DRAM/SRAM. Special-purpose processors. personal computers; microcontrollers. DRAM/SRAM. Special-purpose processors. 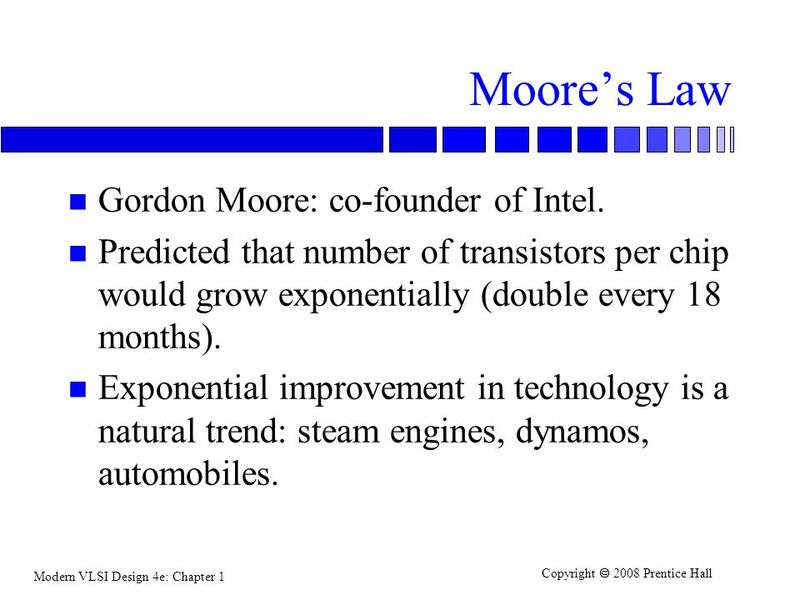 4 Moore’s Law Gordon Moore: co-founder of Intel. 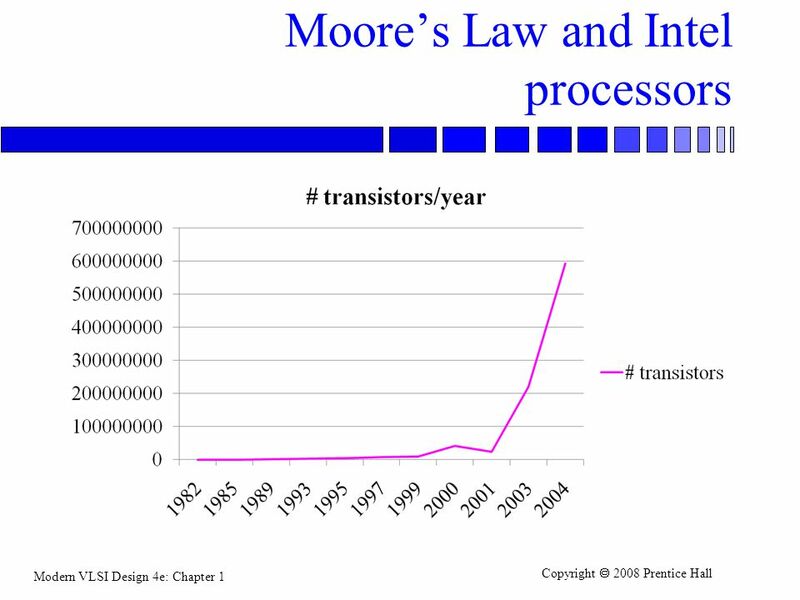 Predicted that number of transistors per chip would grow exponentially (double every 18 months). Exponential improvement in technology is a natural trend: steam engines, dynamos, automobiles. 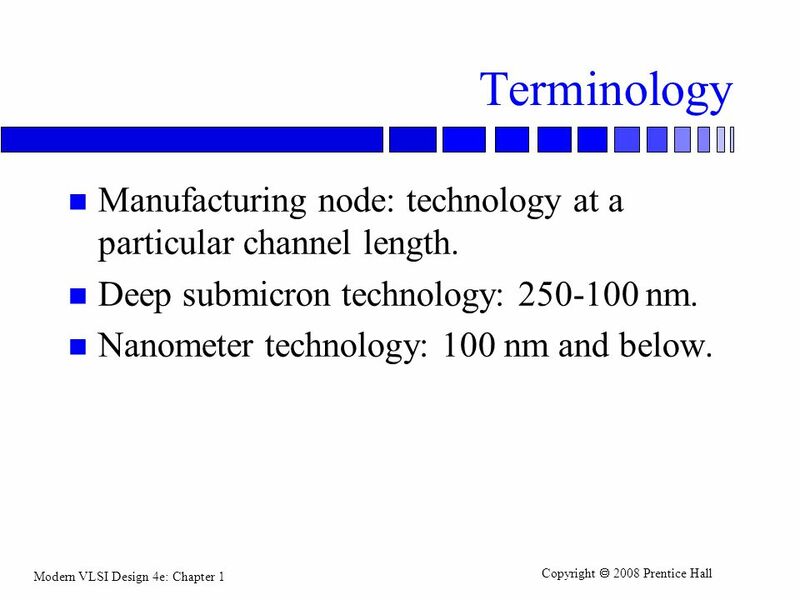 8 Terminology Manufacturing node: technology at a particular channel length. Deep submicron technology: nm. Nanometer technology: 100 nm and below. Current cost: $4 billion. 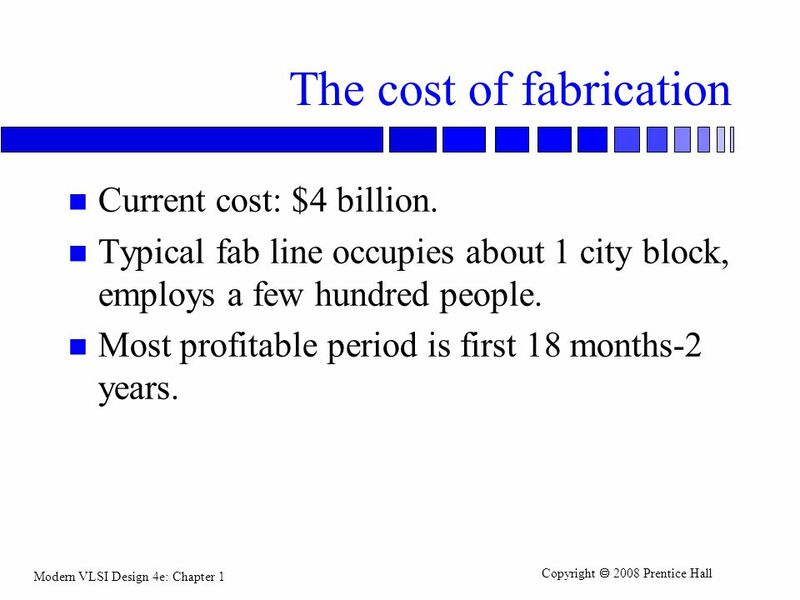 Typical fab line occupies about 1 city block, employs a few hundred people. Most profitable period is first 18 months-2 years. packaging is largest cost; testing is second-largest cost. 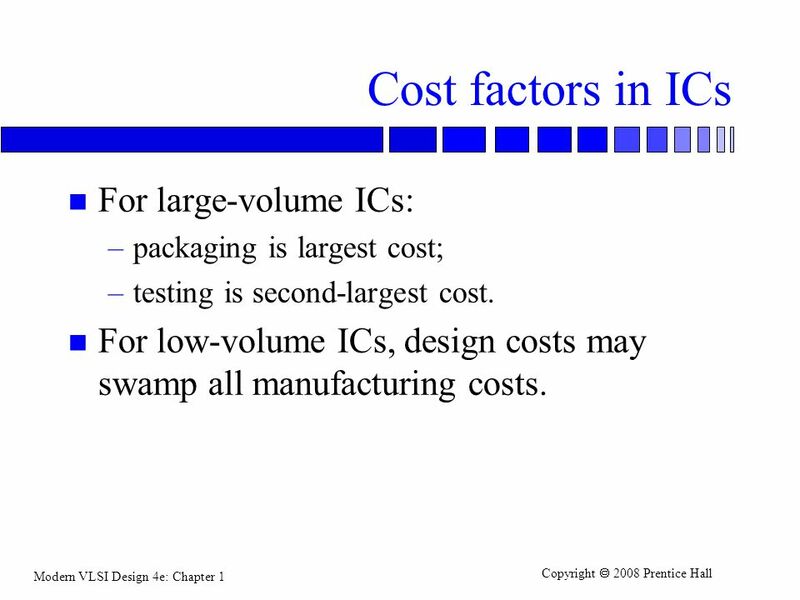 For low-volume ICs, design costs may swamp all manufacturing costs. 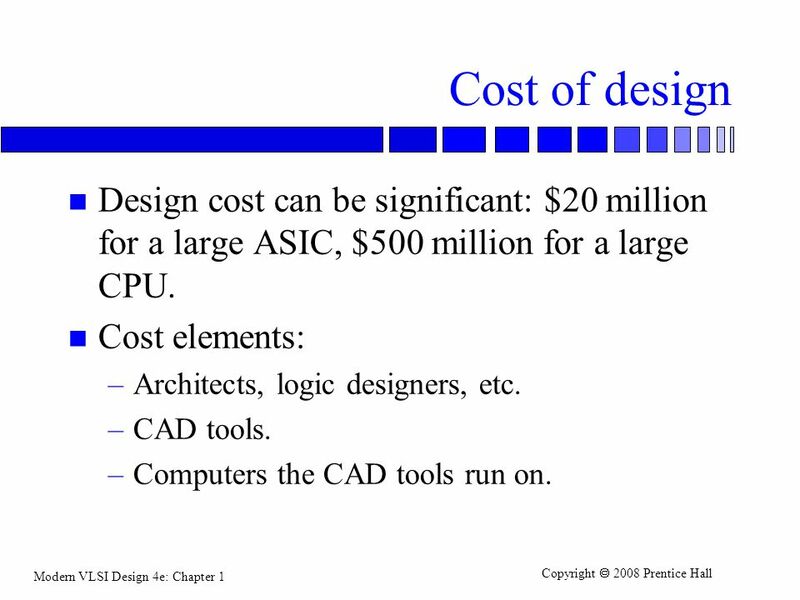 11 Cost of design Design cost can be significant: $20 million for a large ASIC, $500 million for a large CPU. 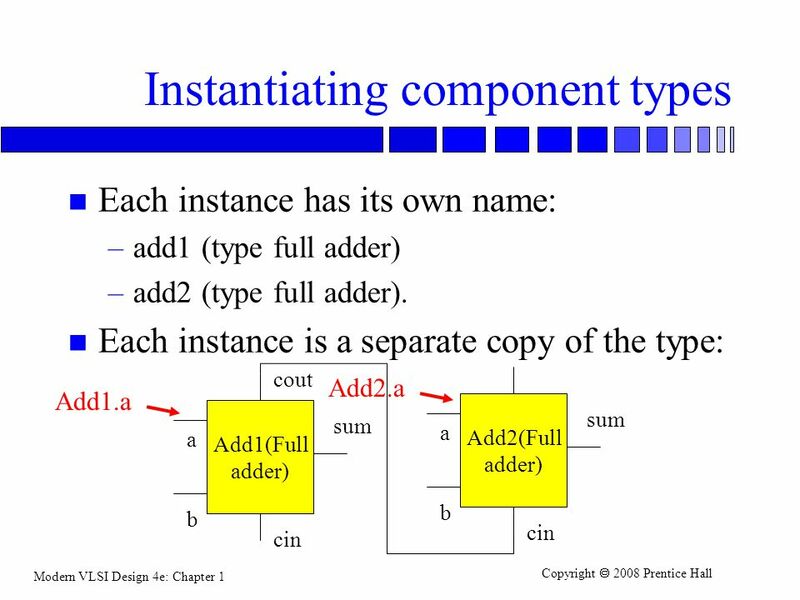 Cost elements: Architects, logic designers, etc. CAD tools. Computers the CAD tools run on. 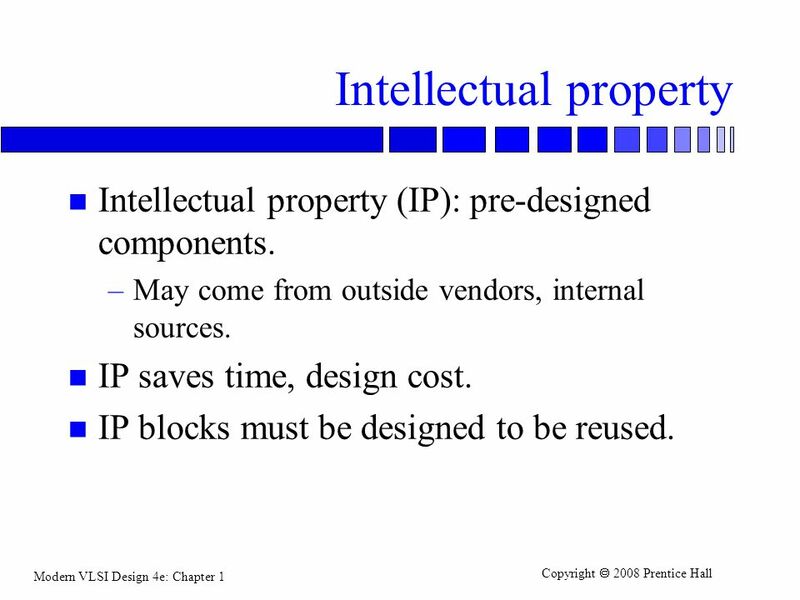 Intellectual property (IP): pre-designed components. May come from outside vendors, internal sources. IP saves time, design cost. IP blocks must be designed to be reused. 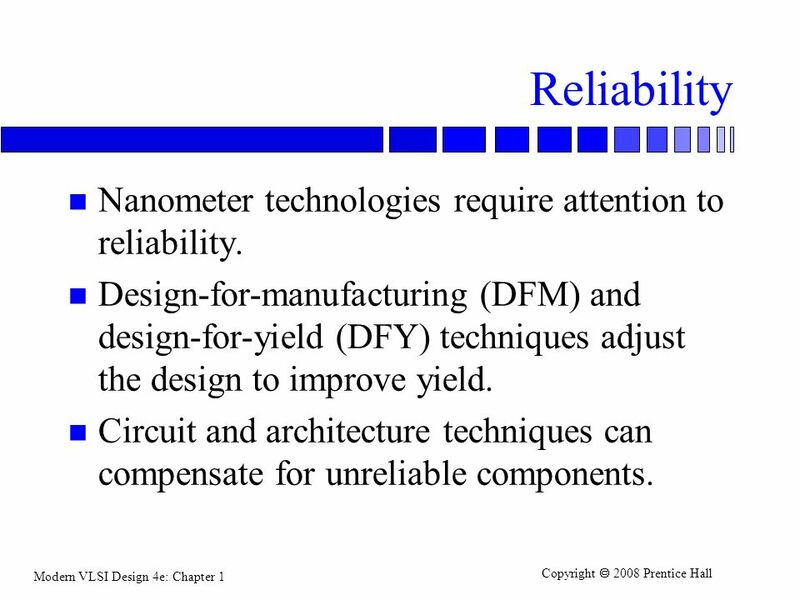 13 Reliability Nanometer technologies require attention to reliability. Design-for-manufacturing (DFM) and design-for-yield (DFY) techniques adjust the design to improve yield. Circuit and architecture techniques can compensate for unreliable components. May be part of larger product design. 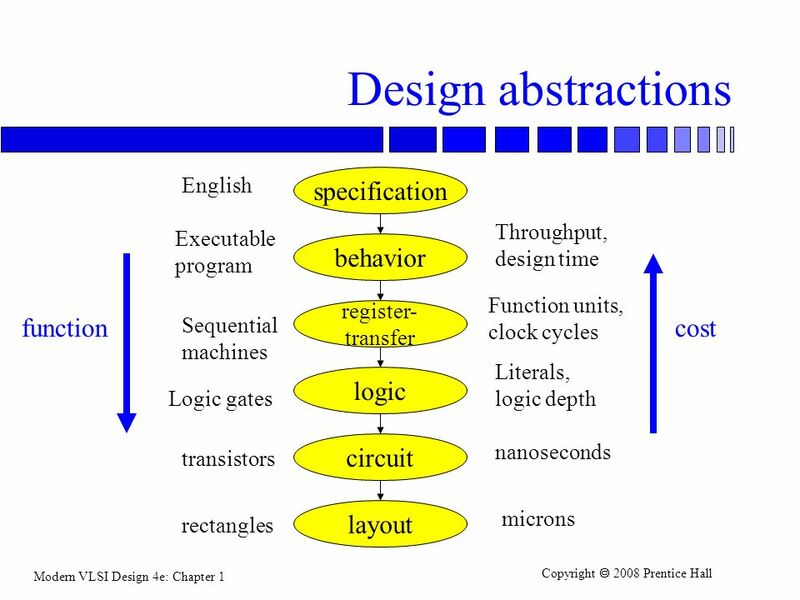 Major levels of abstraction: specification; architecture; logic design; circuit design; layout. Multiple levels of abstraction: transistors to CPUs. Multiple and conflicting constraints: low cost and high performance are often at odds. Short design time: Late products are often irrelevant. 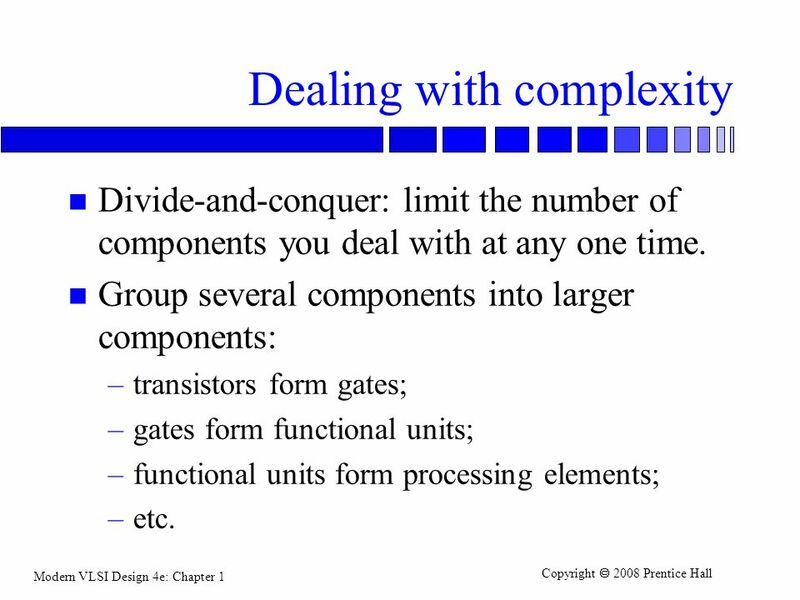 Divide-and-conquer: limit the number of components you deal with at any one time. 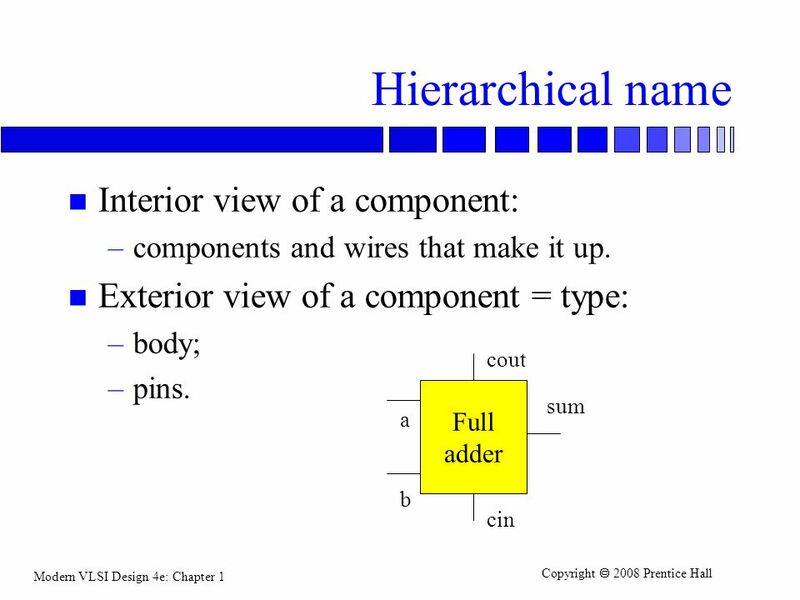 Group several components into larger components: transistors form gates; gates form functional units; functional units form processing elements; etc. 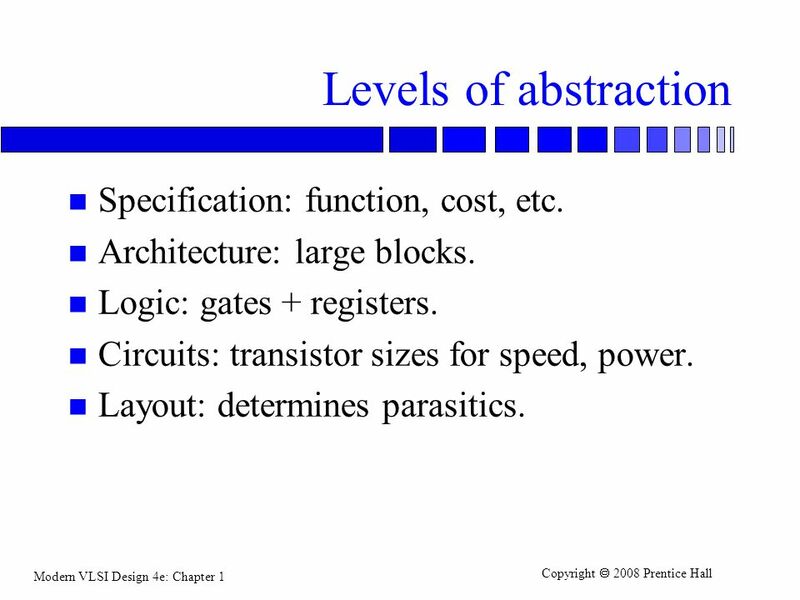 27 Levels of abstraction Specification: function, cost, etc. Architecture: large blocks. Logic: gates + registers. Circuits: transistor sizes for speed, power. Layout: determines parasitics. Top-down design adds functional detail. Create lower levels of abstraction from upper levels. 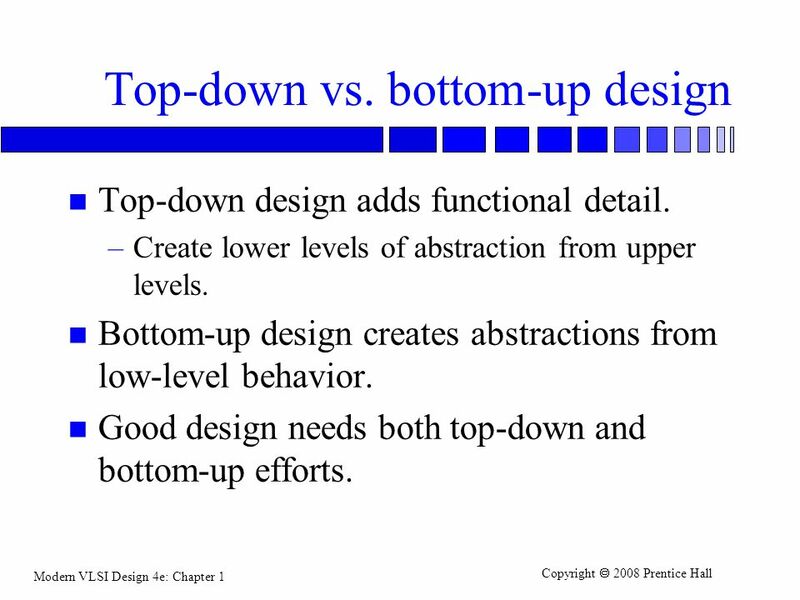 Bottom-up design creates abstractions from low-level behavior. Good design needs both top-down and bottom-up efforts. 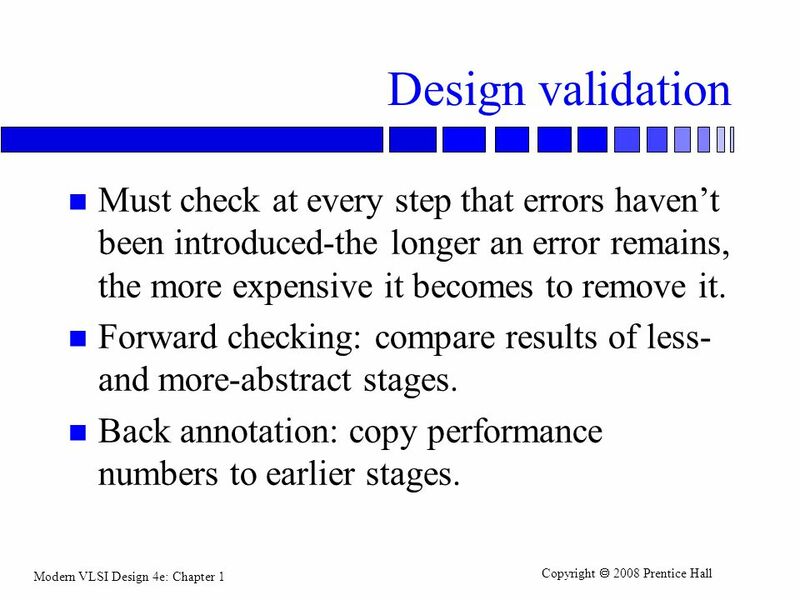 33 Design validation Must check at every step that errors haven’t been introduced-the longer an error remains, the more expensive it becomes to remove it. Forward checking: compare results of less- and more-abstract stages. Back annotation: copy performance numbers to earlier stages. 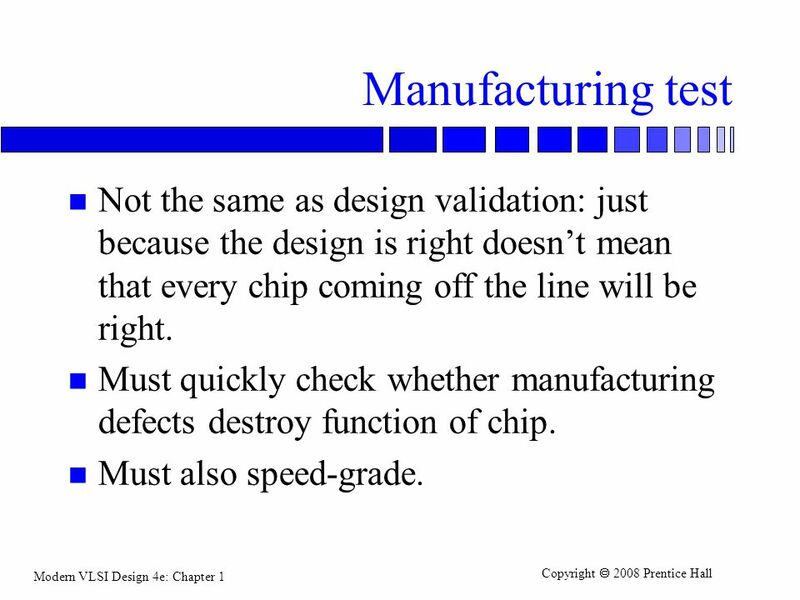 34 Manufacturing test Not the same as design validation: just because the design is right doesn’t mean that every chip coming off the line will be right. Must quickly check whether manufacturing defects destroy function of chip. Must also speed-grade. Standard cell libraries. Memories. IP blocks. Designers must know how to: Create IP. 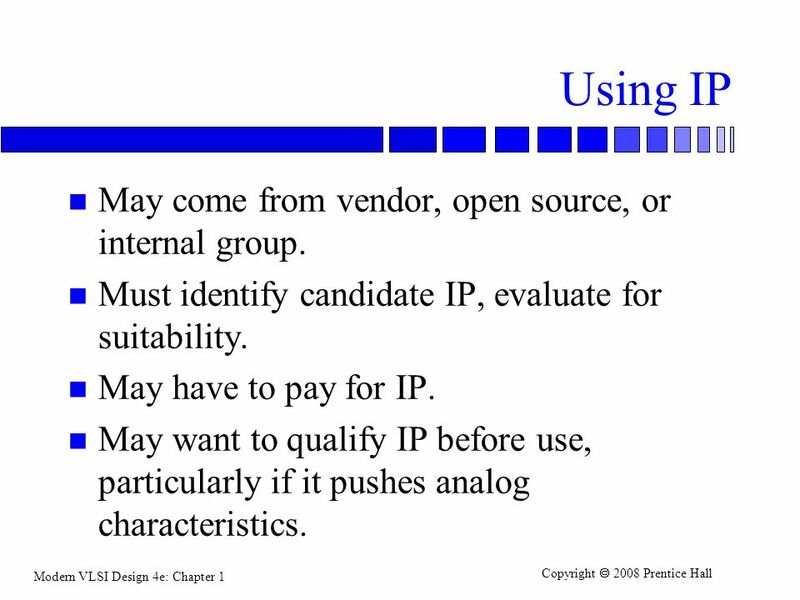 Use IP. 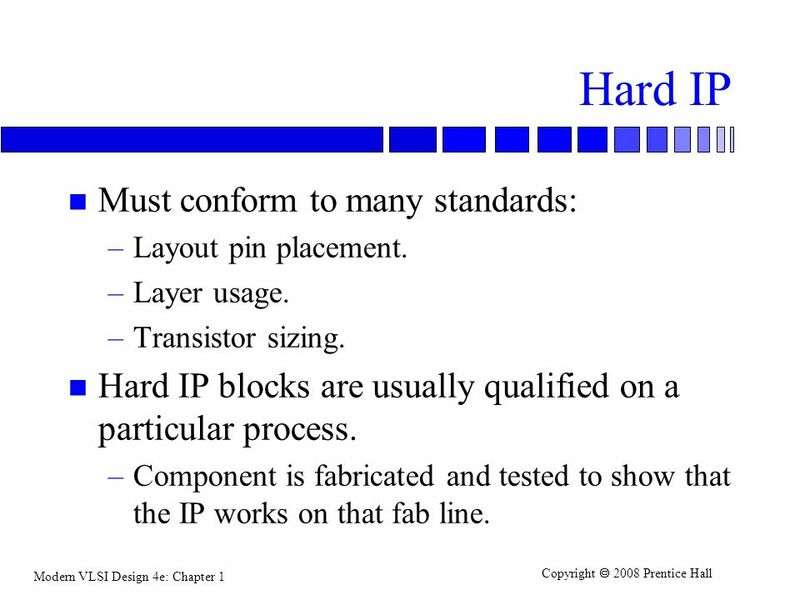 36 Types of IP Hard IP: Soft IP: Pre-designed layout. Allows more detailed characterization. 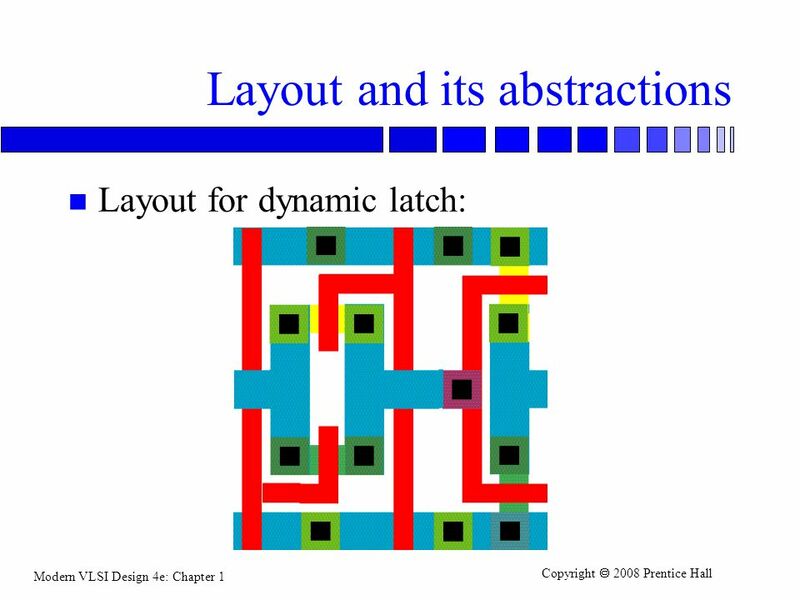 Soft IP: No layout---logic synthesis, etc. 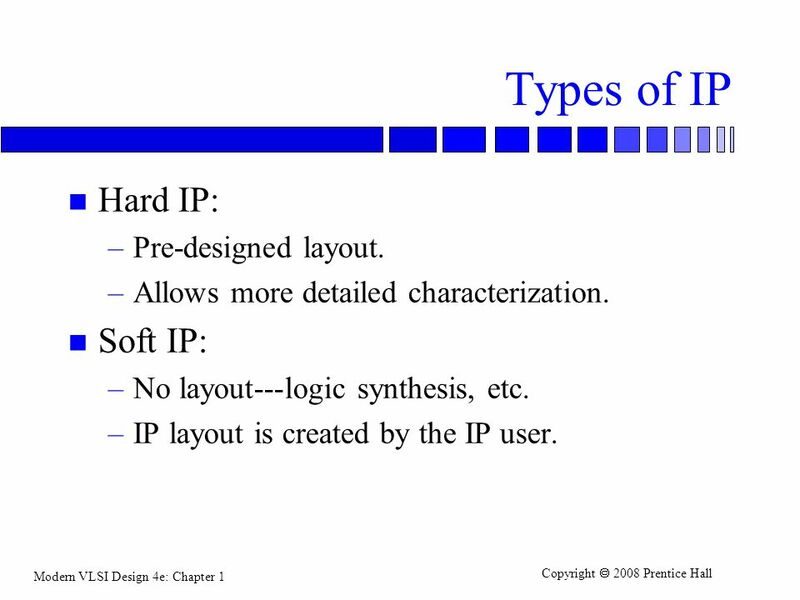 IP layout is created by the IP user. Layout pin placement. Layer usage. 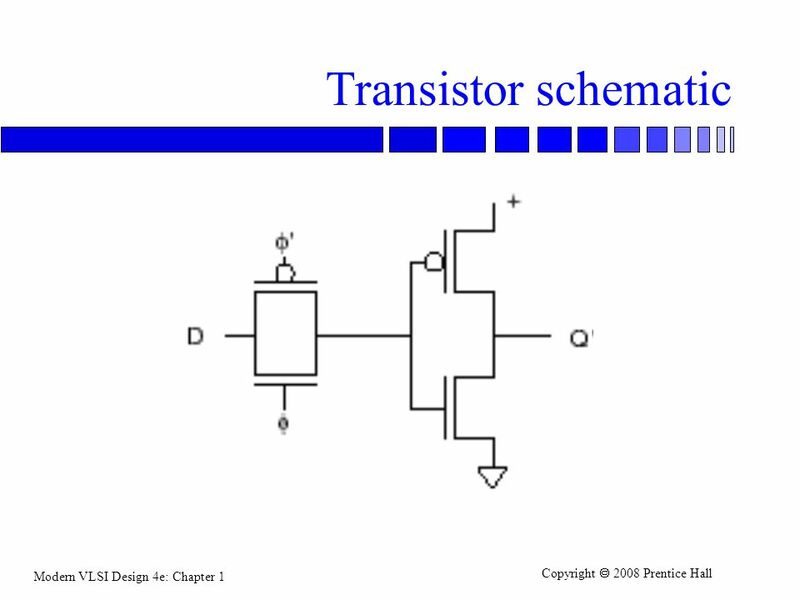 Transistor sizing. Hard IP blocks are usually qualified on a particular process. Component is fabricated and tested to show that the IP works on that fab line. 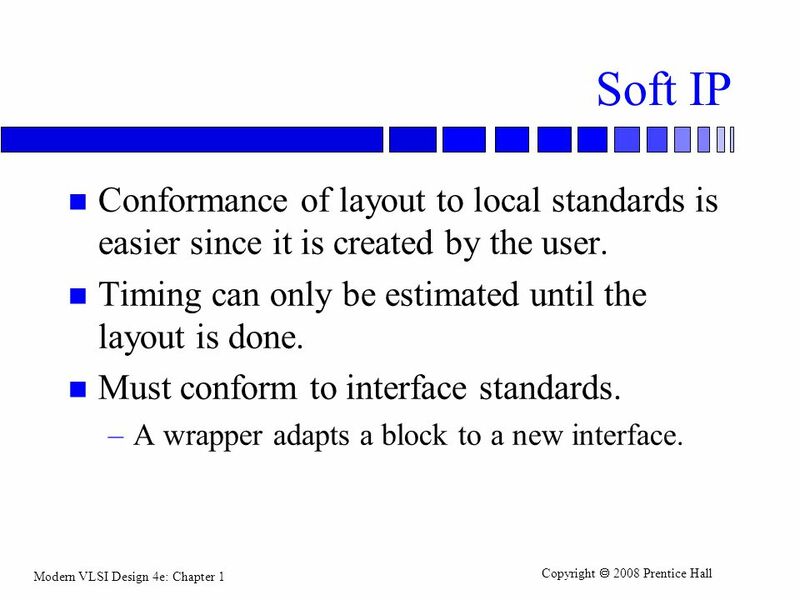 38 Soft IP Conformance of layout to local standards is easier since it is created by the user. Timing can only be estimated until the layout is done. Must conform to interface standards. A wrapper adapts a block to a new interface. Standard cells. Pitch matched in rows, compatible drive. 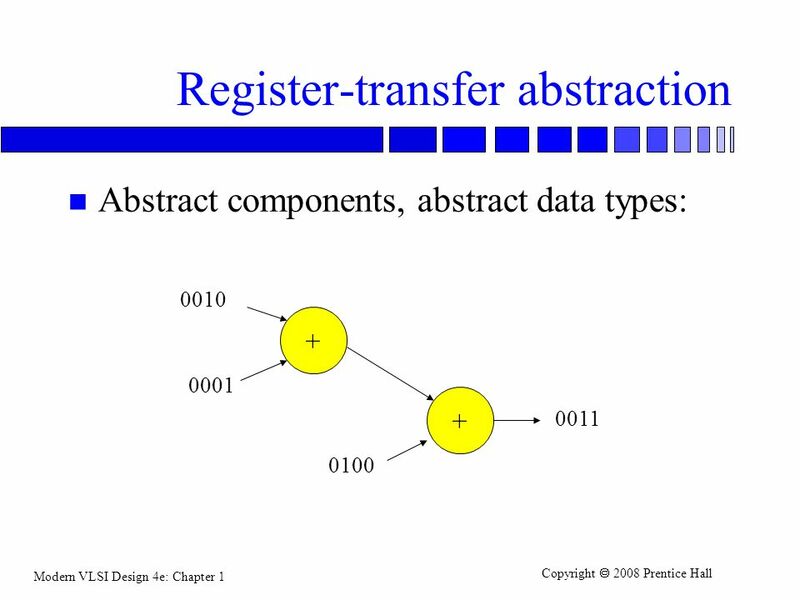 Register-transfer modules. Memories. CPUs. Busses. I/O devices. 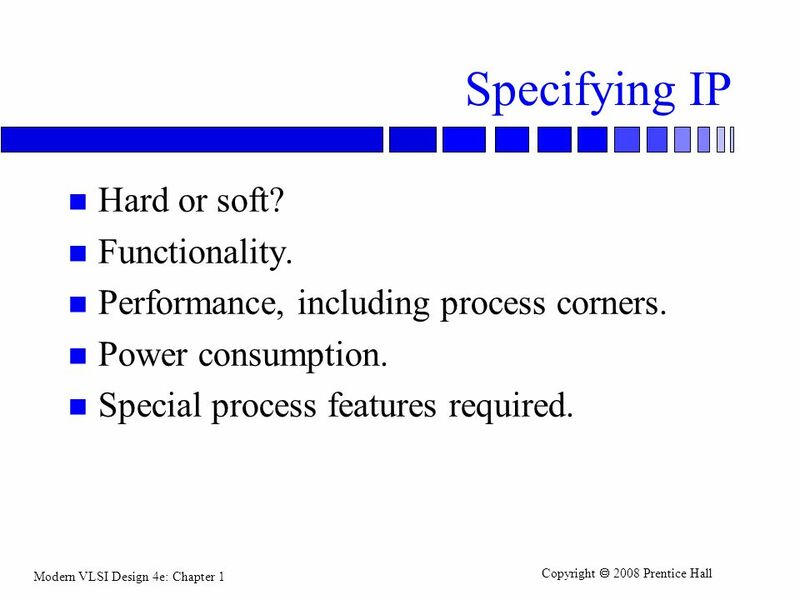 40 Specifying IP Hard or soft? Functionality. Performance, including process corners. Power consumption. Special process features required. 42 Using IP May come from vendor, open source, or internal group. Must identify candidate IP, evaluate for suitability. May have to pay for IP. May want to qualify IP before use, particularly if it pushes analog characteristics. 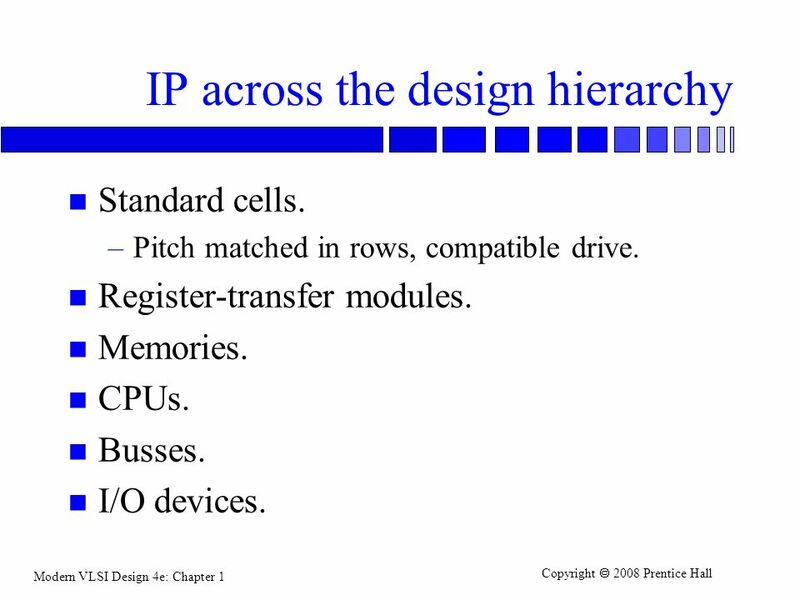 Download ppt "Overview Why VLSI? Moore’s Law. 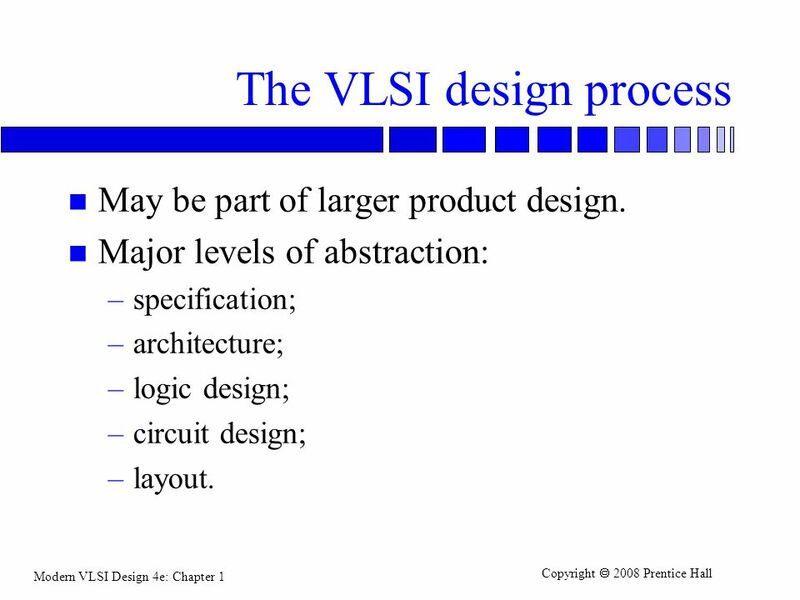 The VLSI design process." TU/e Processor Design 5Z0321 Processor Design 5Z032 Computer Systems Overview Chapter 1 Henk Corporaal Eindhoven University of Technology 2011. 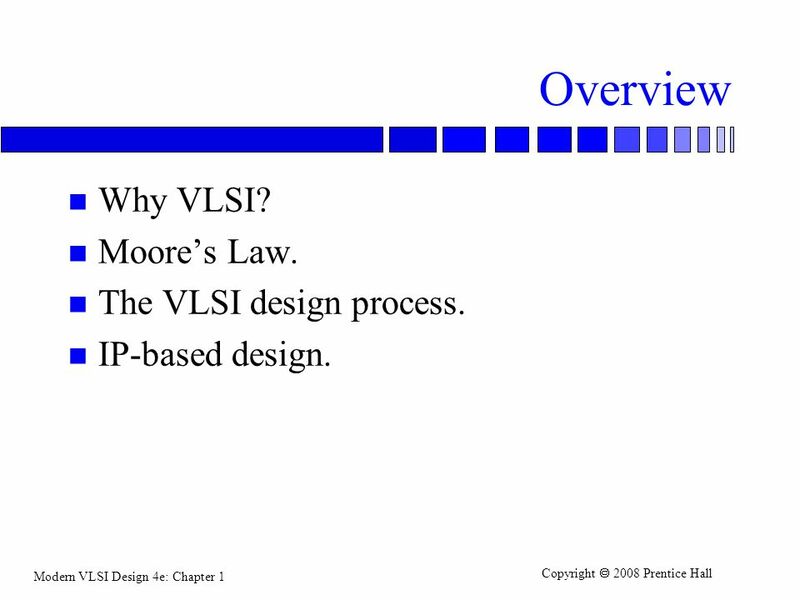 Modern VLSI Design 3e: Chapter 1 Copyright  1998, 2002 Prentice Hall PTR Overview n Why VLSI? n Moore’s Law. 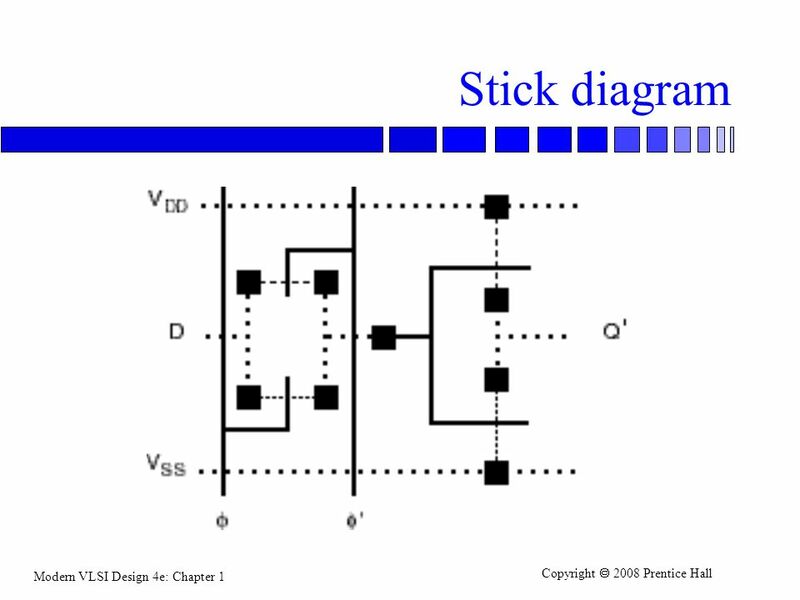 n The VLSI design process. These lecture. CMPT150, Ch 3, Tariq Nuruddin, Fall 06, SFU 1 Ch3. 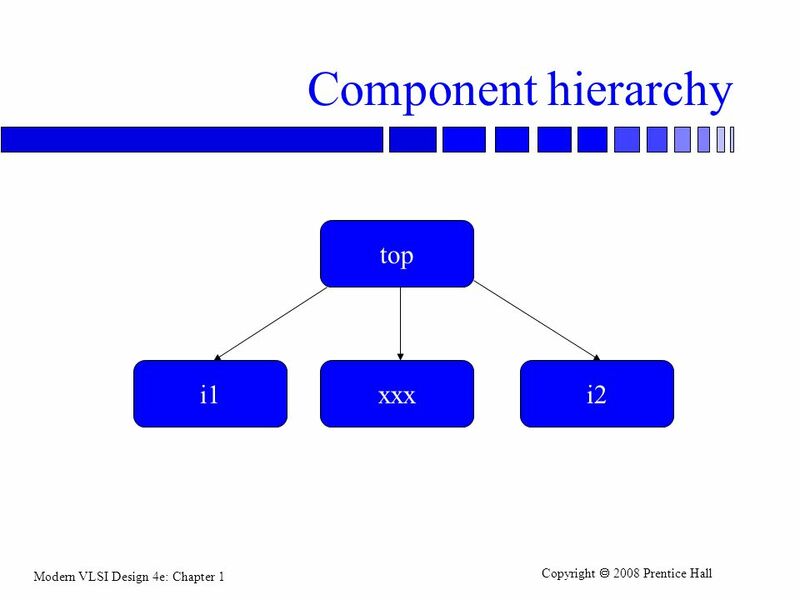 Combinatorial Logic Design Modern digital design involves a number of techniques and tools essential. 1 What this lecture is all about? 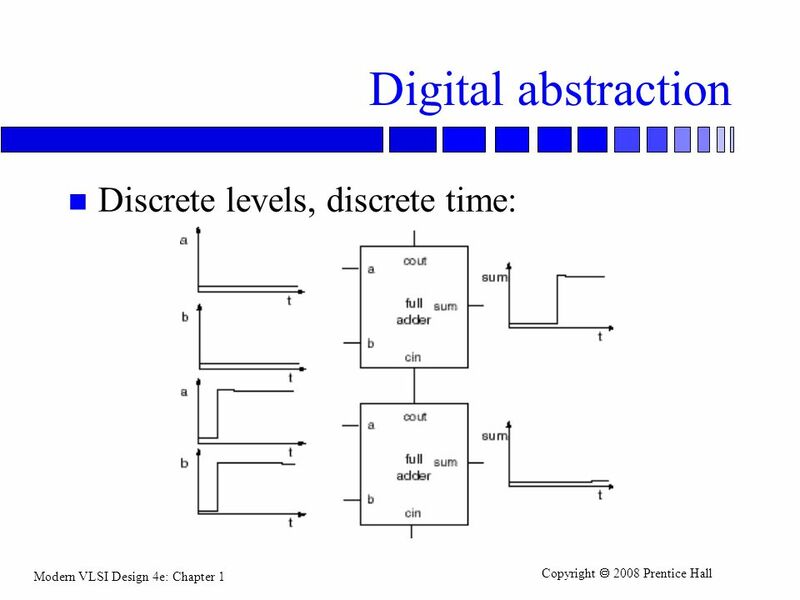  Introduction to digital integrated circuits.  CMOS devices and manufacturing technology. 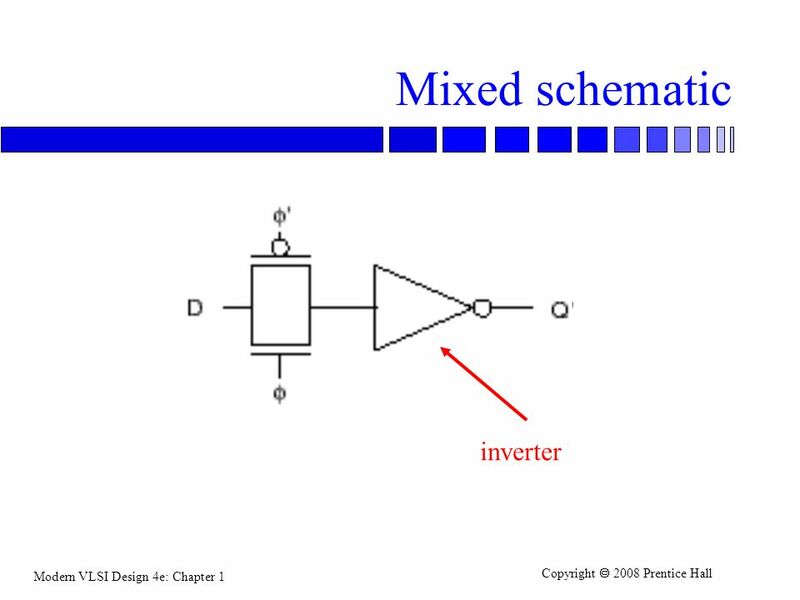 CMOS inverters and gates. Chapter 1. 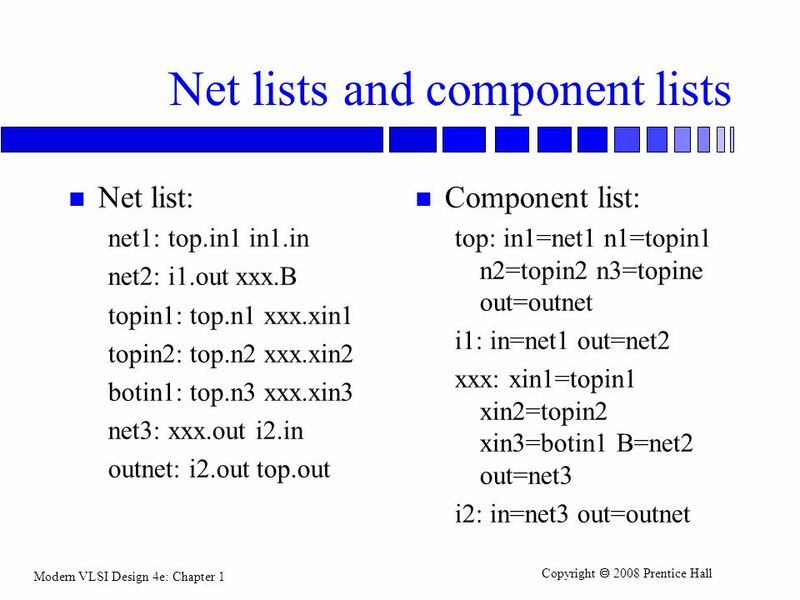 Introduction This course is all about how computers work But what do we mean by a computer? –Different types: desktop, servers, embedded devices. Digital Design Haldun Hadimioglu Computer and Information Science 3/30/2003 CS 2204 Laboratory. 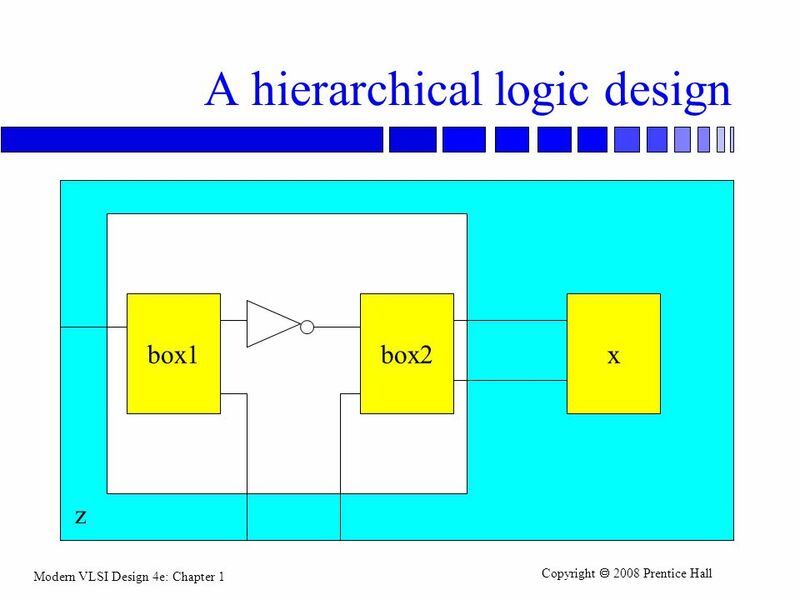 ELEN468 Lecture 11 ELEN468 Advanced Logic Design Lecture 1Introduction. 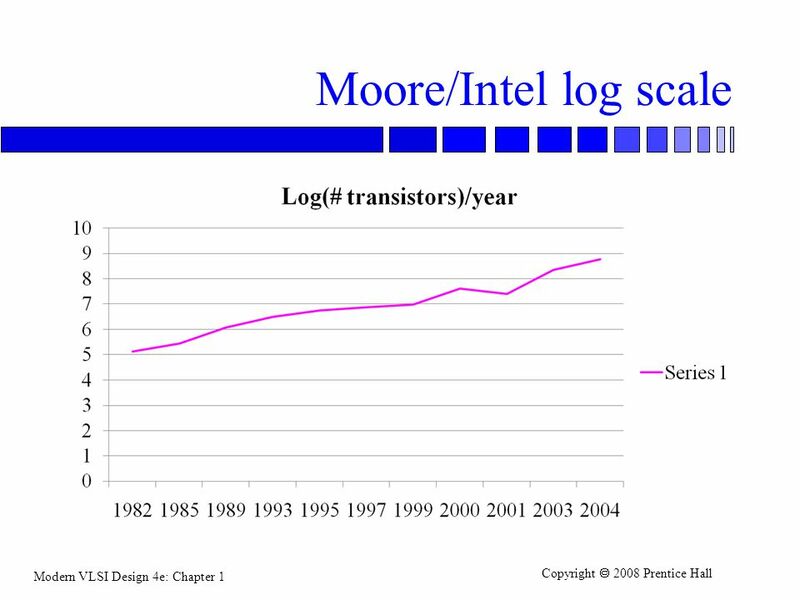 Introduction to CMOS VLSI Design Lecture 21: Scaling and Economics Credits: David Harris Harvey Mudd College (Material taken/adapted from Harris’ lecture. VLSI Tarik Booker. VLSI? VLSI – Very Large Scale Integration Refers to the many fields of electrical and computer engineering that deal with the analysis. 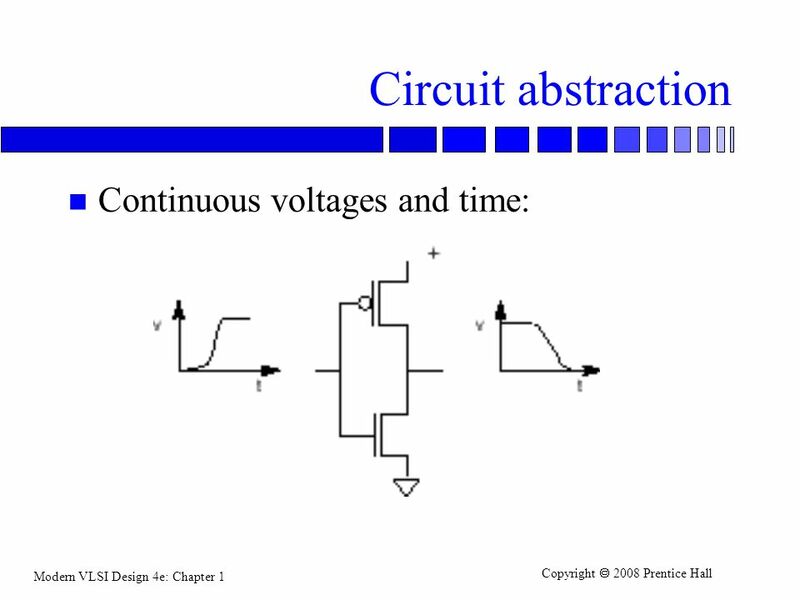 ASIC Design Introduction - 1 The history of Integrated Circuit (IC) The base for such a significant progress –Well understanding of semiconductor physics. 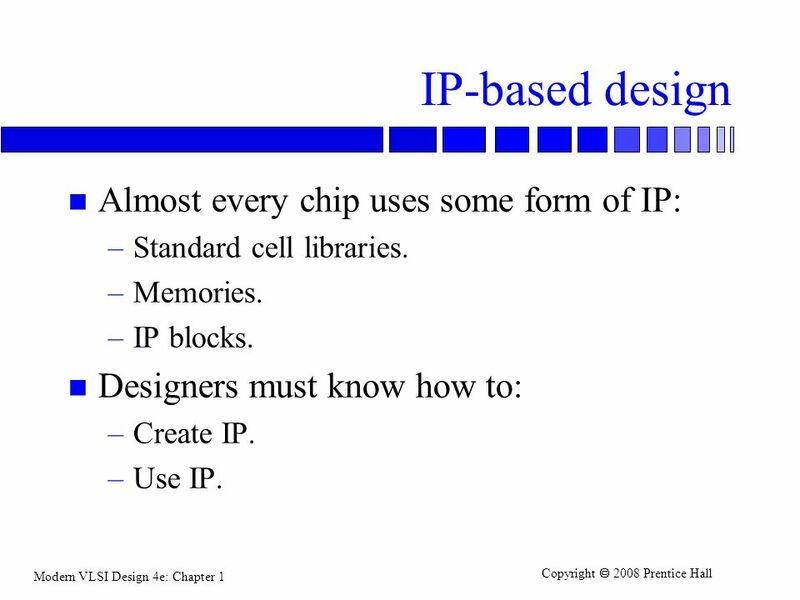 Design and Implementation of VLSI Systems (EN1600) lecture01 Sherief Reda Division of Engineering, Brown University Spring 2008 [sources: Weste/Addison. Chap. 1 Overview of Digital Design with Verilog. 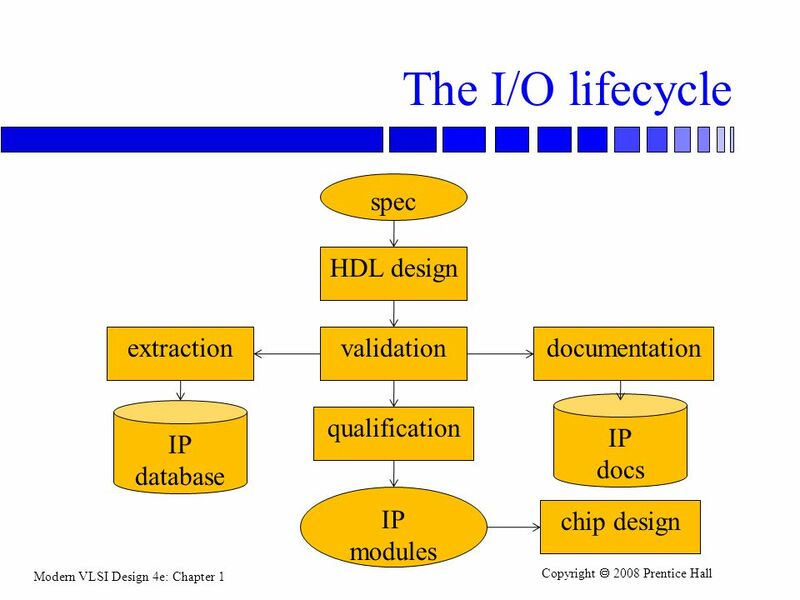 2 Overview of Digital Design with Verilog HDL Evolution of computer aided digital circuit design Emergence. 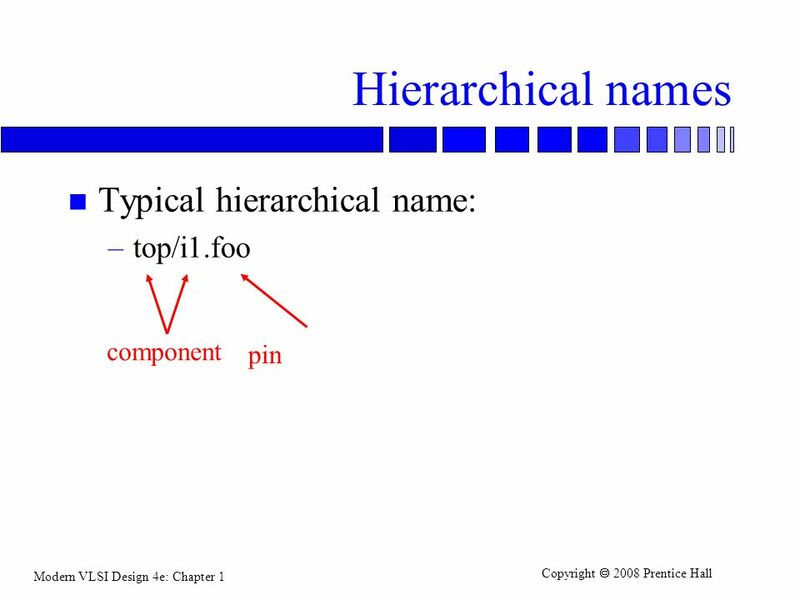 EE141 © Digital Integrated Circuits 2nd Introduction 1 EE4271 VLSI Design Dr. Shiyan Hu Office: EERC 731 Adapted and modified from Digital.